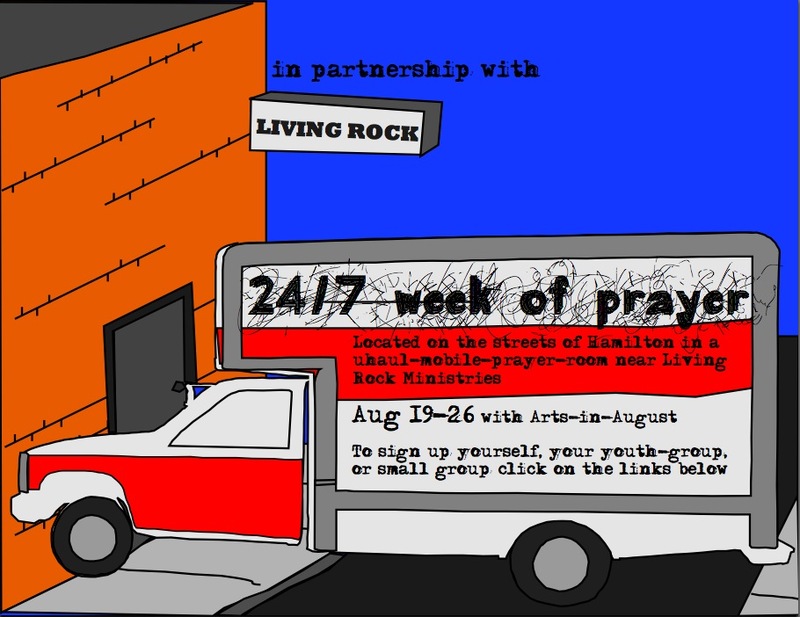 We’ve just finished a week of 24/7 prayer in the back of a UHaul truck. 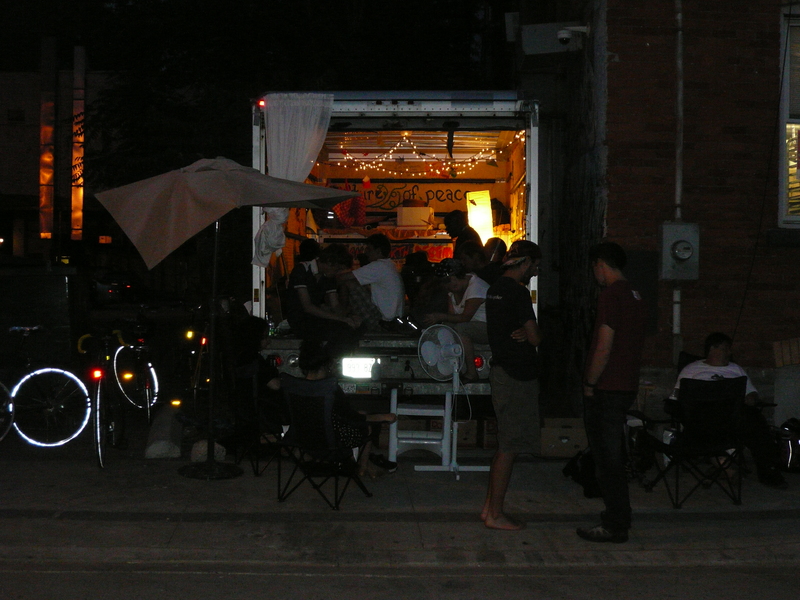 Parked in the downtown core, right behind Living Rock, a ministry to at risk youth, the Prayer Truck facilitated sacred space in and around it. Over the course of the week, faithful prayer warriors came and went, filling up the truck with their prayers, paintings, songs, collages, and other creative prayer expressions. For six (or more!) hours a day, my job is the “Doorkeeper”. 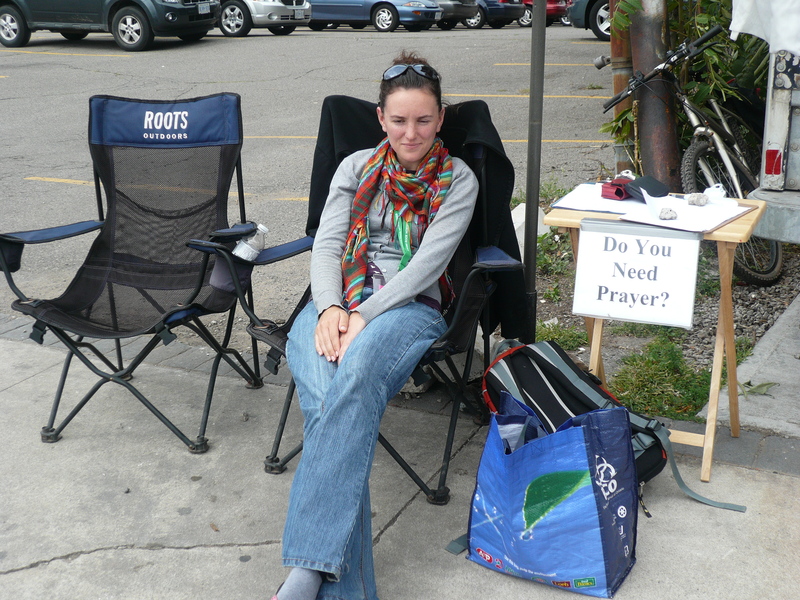 I watch over the truck, filling any empty prayer slots and practicing hospitality with the participants and the passers by. My setup is simple. I have two lawn chairs, a bin of bottled water, and a patio umbrella (which got mangled in a massive storm – we were evacuated at one point to the basement of the adjoining ministry as tornadoes touched down in some of the surrounding areas). Near the end of the week we added the sign “do you need prayer?” so people walking by could stop and share prayer requests. It was astounding how many of them did. 8 am – Sunday. Sam is homeless – sort of. He’s lost his key to his room in the rooming house and no one will let him in. Clouds gather and Sam gestures to the sky. “Don’t worry, I have power over the weather!” We stay mostly dry. “It would have been much worse,” he consoles me. 4 pm – Monday. I’m in the truck. Suddenly four half dressed and fully intoxicated young men burst in. “I’m f-ing gonna do it! I’m gonna pray!” one of them exclaims. I scootch over a little so I’m sitting on my backpack, which has my wallet and cameras in it. “Ok gentlemen, you’re in the prayer truck. What are we going to pray about?” They write their prayers on the walls – ok, so they write their gang tags, and the names of their girlfriends, but it’s a start. The tell me how they’re off drugs and trying to clean up their lives, and in the end we all pray together for a couple of them who want to go into treatment. 8 am – Wednesday. One of the guys from Monday swaggers up and sits in the free chair. Sober this time. We watch the city wake up. He shows me his scars (bullets, knives, and a screwdriver! ), shares about how he’s trying to build a new life. “This song is f-ing amazing – you’ve got to hear it!” We sit side by side, sharing earbuds on his ipod. 6:30 am – Another morning, another sunrise, another young man. Waiting for the Rock’s breakfast program to start. He is enthusiastically describing to me how to make a baked Alaska, and wants to be a pastry chef. We talk about the importance of following your passion. I’ve been here every day for a week now. Drinks for the thirsty and company for the lonely. All it took was space. An extra lawn chair. Free time in my schedule. They know I’m sitting quietly praying and waiting, and so they come. I’m hopelessly addicted, overwhelmed by the pleasure of heaven in what we are doing. We’ve obtained permission to go another week. We’re taking the weekend off to catch our breath but Monday, 6 am, I’ll be out there again. Making space. Asking God to fill it. 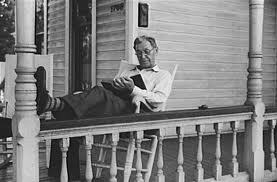 My neighbor is sitting out on the porch again. Looks like he’s retired. His yard it immaculate, and sometimes I see him staring at his garden, daring weeds to grow so he can pluck them out, or polishing the glass lamp covers by his front door. He’s a guy with time on his hands. I however, am not. I’m weeding my garden – with this weather I’m amazed how everything is wilting but the weeds somehow manage to thrive. I’m feeling the heat of the day and the pressure of all that I need to accomplish before it is through. On my way back in the house, I glance over at my neighbor again. He is peaceful and still, watching the street go by, ready and waiting for friendlier and freer neighbors than I to come and visit on his porch. Feeling guilty, I slink inside. I don’t know about you, but I’ve found that it’s futile to try to add prayer to my to-do list. Over the years, if I don’t intentionally create space to meet with God, my communion with Him falls by the wayside, a victim of my type A personality and some of the predominant spirits of the age – busyness, productivity, technology and entertainment. Which is why I’m going to fast non work related media for the week of 24/7 prayer we are hosting August 19 – 26. No tv, movies, youtube, superfluous texting (did I really need to rofl? 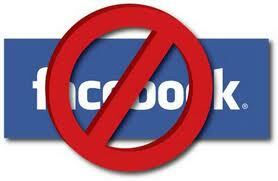 ), fiction and recreational facebook! I’ve done it before, and am amazed how twitchy I get the first day, and how peaceful I am by the end, my interior space expanded and uncluttered. I wanted to invite you to join me. In the media fast, and in the week of 24/7 prayer. 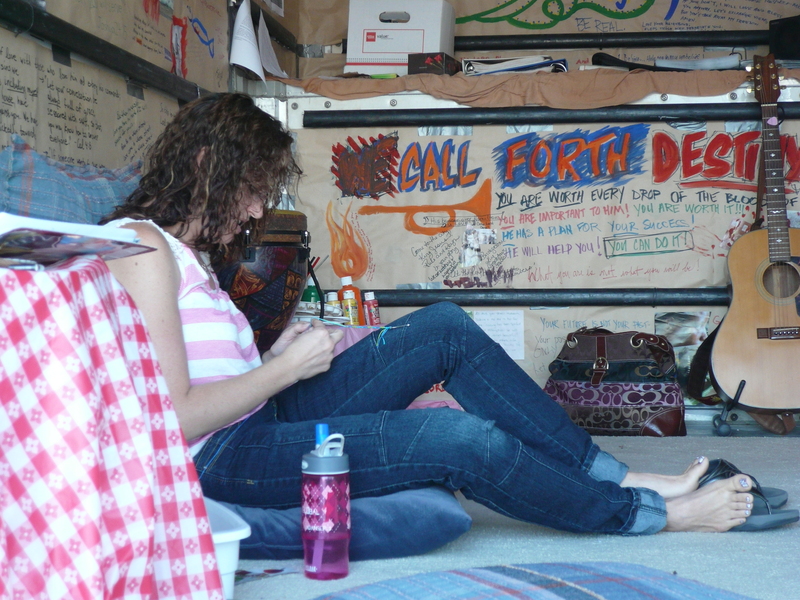 Make some room for God and then make a pilgrimage to the UHaul truck that we’ve decked out as a creative arts prayer room. Explore connecting with your Creator through painting, hand drumming, weaving, and even origami!